In the hills near where I grew up, the air is filled with the smell of the fennel which grows wild all over. When I would walk with my grandfather, we would pick the tips and rub them between our hands and breathe in the smell. I still pick fennel and smell it when I walk by. Fennel seeds are used medicinally for ailments of the digestive tract. Most notably to to treat gas, bloating, stomach pain and nausea. Up to five cups of infusion a day can be used according to The Encyclopedia of Medicinal Plants by Chevallier and one cup of water needs about 1/2 tsp of seeds. I was lucky enough to find a commercial source of fennel tisane to simplify all the measuring business. Bloated or not… I think that this stuff is delicious, and if you like licorice, you might too! Teekanne, the company which invented the flow-through tea bag, sells a very tasty boxed fennel tisane which I picked up at a neat shop in Berkeley, CA called The Country Cheese and Coffee Market. Fennel has a strong taste like anise or licorice and is probably not for everyone, but if you decide to try it, I hope you think it makes a great cuppa! Sorry for skipping the Tisane Thursday this week, but I am out of town and couldn’t find a chance to post yesterday. Today, however, my brother vacated and his computer was up for grabs! 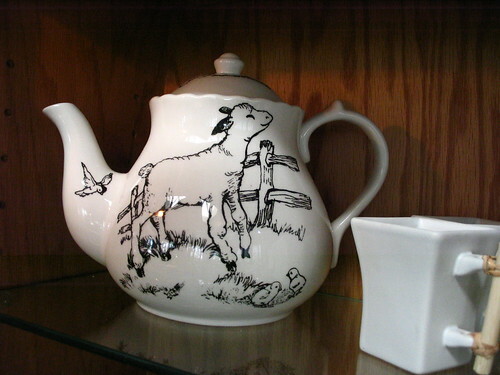 I decided to share with you all the teapot gadget that my parents use for their cuppa since I have searched in vain for a tea room or tea house in the area and have come up short. (The one I had discovered via the internet before leaving is apparently only alive in memory). But on to the tea! My brother, knowing my parents love of the stuff, found a neat little tea infuser to give to them a couple of years ago. He picked one up from Think Geek, but I have heard tell that you could procure one from Amazon.com, or directly from adagio teas. Replacement filters are also available. 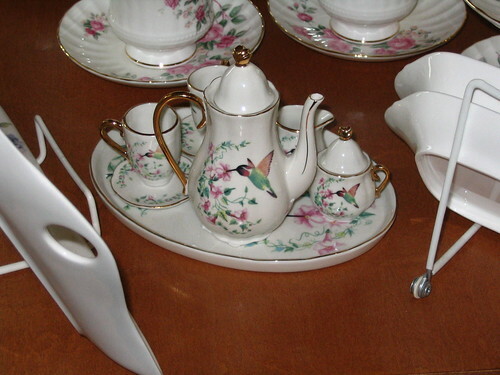 As for the device itself, my parents love it and I think it would be perfect for anyone who likes loose tea, but doesn’t want to fiddle with any extra implements. After the tea has finished steeping, just place the device over the top of your favorite cup (pick a big one or be sure to watch how full it’s getting) and soon you’ll be enjoying some great tea! One of the neatest things about this gadget is that the feet on the bottom keep the tea from gushing out before it is placed on top of your favorite cup. Another great feature is that since it is all plastic, you can place it in the microwave and the dishwasher. So, if you aren’t adverse to plastic, this thing could be just the ticket! Have a great weekend everyone! Be sure to enjoy some tea. Since you all read the last post and found out how great peppermint can be for you, I bet you are wondering where you can turn to satisfy your voracious habit. I am here to tell you that the solution is nigh because, in my experience, peppermint is an extremely easy plant to grow. It’s basically a weed so anyone with space could easily end up with more than they could ever use. If you ask around you could probably even find someone willing to pull some up out of their garden for you because it is taking over! Peppermint should probably be planted in a container so that it doesn’t spread like crazy. I also recommend putting it up off the ground so that lovely things like snails (ick!) don’t help themselves. Mint should be grown in a place that is sunny and moist, but can be fine with only a few hours of sun a day. If your mint is in a small container, you will probably need to take more care that the soil does not dry out than you will if it is in the ground. I have peppermint plants myself (I got them by uprooting someone else’s nuisance) and find them perfect for tisane, garnish, a tasty snack… or the occasional mojito! Here’s to your first cuppa of home-grown mint. Hello readers! We’re trying a new regular topic: tisanes or herbal infusions or herbal tea… depending on where you’re from. Don’t get me wrong, I love tea… and the stronger the better! However, if you’re anything like me, you don’t make it home until later in the evening and you hesitate to drink a caffeinated beverage as you wind down and get ready for bed. I have accumulated a hefty supply of different tisanes over the years and I have really enjoyed many. I would love to share some with you by way of another interest of mine, medicinal plants. Keep in mind, however, that I am not a professional herbalist and I am never giving medical advice. My goal is to let you know how good that tisane you’ve enjoyed for years is for you! Peppermint has been around for at least three thousand years, and was used by Egyptians, Greeks and Romans prior to becoming popular in Europe in the 1700’s. Medicinally, peppermint is used to treat gas, bloating and colic but peppermint can also be effective in other ways. The next time you reach for your Bengay, IcyHot or Vick’s Vaporub, I hope you remember that menthol, which has a cooling, anesthetic affect on the skin, makes up a major part of peppermint. Other mints such as spearmint are related to peppermint and have similar, though milder, medicinal properties. For digestion, an herbalist might prescribe peppermint to be taken as an infusion several times a day. Dried or fresh peppermint can make a nice tisane, and in general more fresh than dried is needed for a given volume of water. The Encyclopedia of Medicinal Plants by Chevallier recommends 1 tsp dry or 2 tsp fresh per cup, but peppermint tisane can be made to your taste. I have a friend who shoves as much fresh mint as will fit into a teapot to make her tisane. I find a slight difference between the taste of tisane from fresh vs. dried peppermint, but both are satisfying. Many blends that include peppermint (and other mints) are available commercially and quite enjoyable. My favorite Celestial Seasonings tea blend contains decaffeinated green tea, peppermint and just a touch of some other herbs. It is perfect for an evening drink and hits the spot when I have a cold. It is called Candy Cane Lane and although only available seasonally in the grocery store, I was able to pick some up on my recent trip to the factory in Boulder, CO. The flavor comes mostly from the peppermint (my palate has trouble distinguishing the flavor from the green tea) but the blend has much less of what I would call “raw plant” flavor than straight peppermint. I also find the finish to be much smoother than straight peppermint, which can have a delicious, but strong, flavor as you swallow. However you drink your peppermint, it makes quite a satisfying cuppa. This past week I was lucky enough to find myself in Boulder, CO on a business trip with a couple of free afternoons. 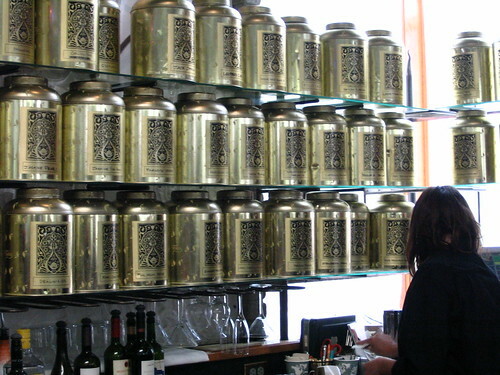 In addition to plenty of natural beauty, Boulder can be a tea-lover’s paradise! 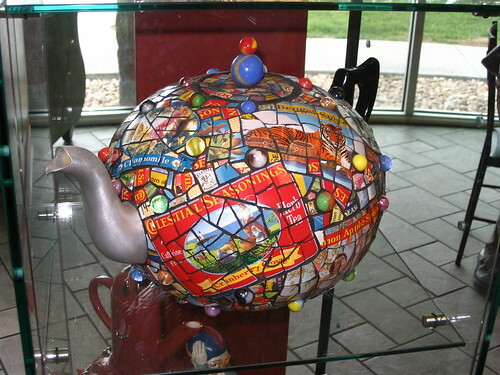 As nice as the Celestial Seasonings tour was, the real jewel of Boulder’s tea scene was yet to come. Credit where credit is due, however, and I might not have made it there without the address on the pamphlet that came from Celestial Seasonings! After dragging my coworker/conference-mate to a place famous for herbal tea, I was looking forward to satisfying both of our black tea habits. 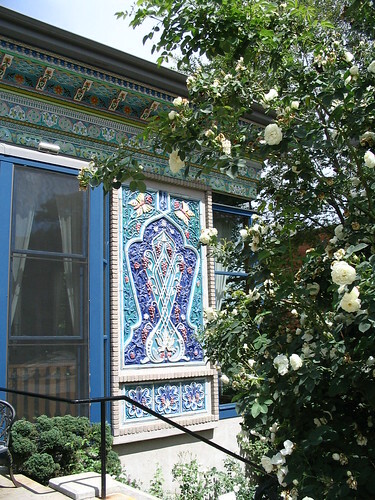 The Dushanbe Teahouse was given to Boulder by their sister city, the capital of Tajikistan, Dushanbe in 1990. 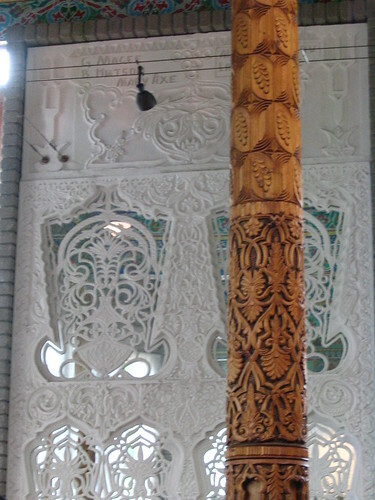 The hand carved structure was sent disassembled and the tea house opened on May 15, 1998 after being reassembled by the Tajik artisans who also made the journey. It is the only tea house of its kind in the Western Hemisphere and is also the largest tea house outside of Asia. The building is stunning, but we came for tea, and boy, was it worth it! 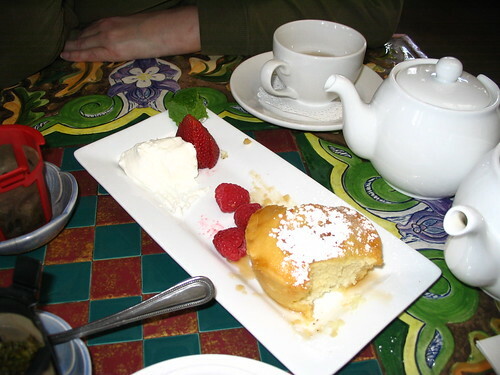 In addition to appetizers, entrées and desserts, the privately owned restaurant that operates in the teahouse has an impressive tea menu that consists of over 100 premium loose-leaf teas, many exclusive. Each pot of tea holds about 2.5 cups and is about 3-4 dollars. Considering that one can pay almost 2 bucks for a mediocre teabag in tepid water at a coffee shop, I was pretty excited! We picked Puerh Imperial, Tun Ting Oolong and Silver Needle (white tea) and snacked on hummus and samosas while we enjoyed the fleeting sunshine (with a dead camera battery, unfortunately). When the tea came to the table, our waitress Jen brought a timer and let us know how long to let the teas steep. I enjoyed the puerh and even my coworker, who doesn’t usually go for that kind of thing, said that she would drink it again. The white tea was pleasant and light, but that oolong was amazing! After staring at the foreboding sky for three pots worth of tea, we decided that we’d pushed our weather luck for far too long. Jen, who I can’t recommend enough, couldn’t have been nicer when we asked if it would be possible for us to move inside. She got us a table in seconds and the tea and dessert we had ordered before fleeing the downpour was there to meet us when we got inside. For dessert, we ordered chocolate cake and gingerbread cake, (which came with delicious chai flavored ice cream) and Zao Bei Jian black tea. The Zao Bei Jian was so excellent that my coworker (henceforth referred to as Kyla) parted with some $ to take a bag home with her. The Dushanbe Teahouse also had lots of teapots to resist buying. 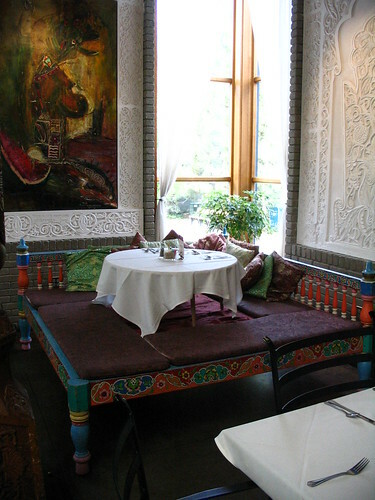 We were so glad that we had gone to the Dushanbe Teahouse. In fact, Kyla and I liked it so much… we came back the next day (equipped with a charged camera battery)! Nerds, huh? 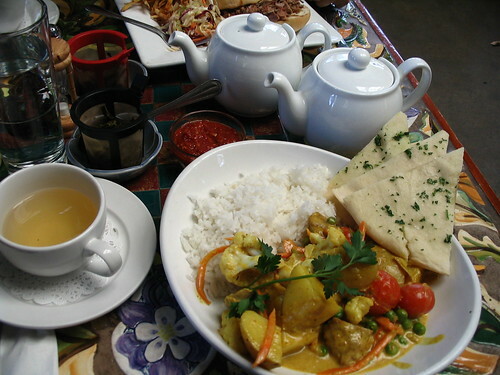 On our second trip we decided to try lunch, I had some curry and Kyla had some pulled pork that she said hit the spot ( it smelled pretty good, but as a veggie, I didn’t go there :p ). For tea we chose two oolongs, Jinxuan (Formosa) and Ti Kuan Yin. The Jinxuan was not at all what I had expected, it tasted vegetal like some green teas, but had a nice sweet flavor as well. The word that came to my mind as I sipped was raw, and it was refreshing. The Ti Kuan Yin was quite tasty too. For dessert we had the Ricotta Butter Cake which was far and away the best dessert we tried there. It was so good that we ate half before I had the presence of mind to take a picture! 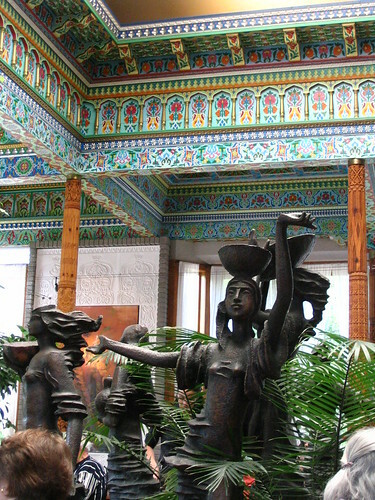 The Dushanbe Teahouse was a real treat. If I lived in Boulder… I would basically never leave! 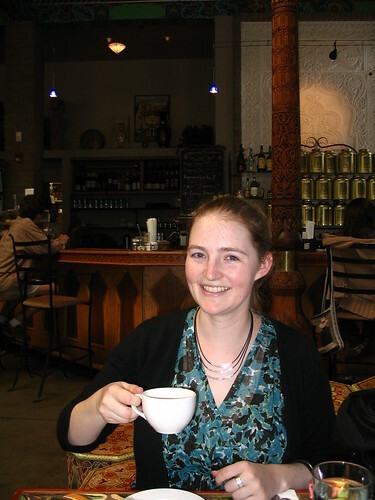 The food was pretty good, but I really enjoyed having a good place to sit and sip new, delicious tea with a friend (in or out of the weather!). But don’t take my word for it, check it out! Last week I was lucky enough to find myself in Boulder, Colorado on a business trip with a couple of free afternoons. 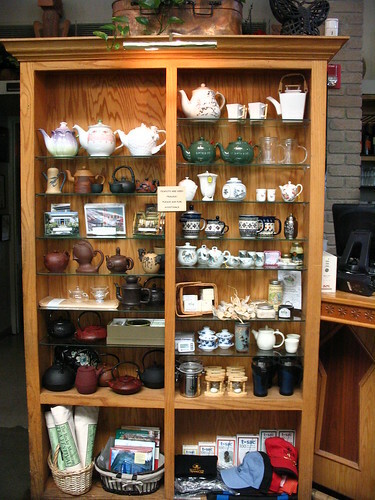 In addition to plenty of natural beauty, Boulder can be a tea-lover’s paradise! 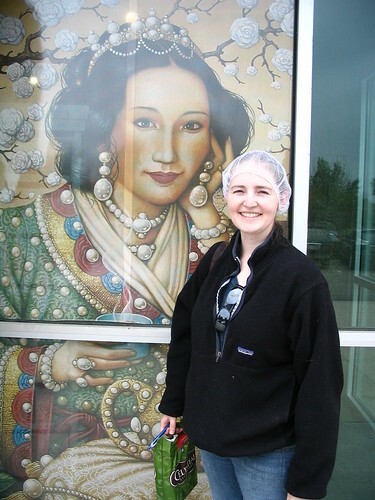 My first tea related outing in Boulder brought me to the Celestial Seasonings Factory for a FREE tour. 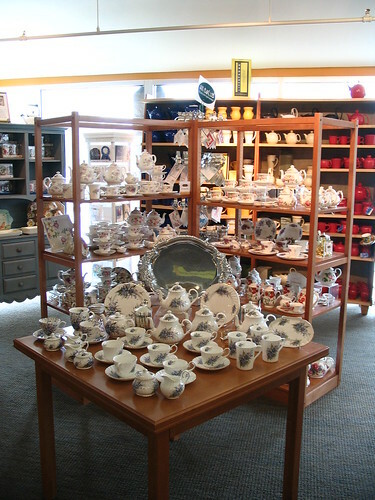 Celestial Seasonings is the largest specialty tea company in the United States and has been around since 1969 when the founders foraged for herbal tea ingredients in the nearby mountains. These days, ingredients are sourced from all over the world, but the company has tried to keep its original sprit intact. 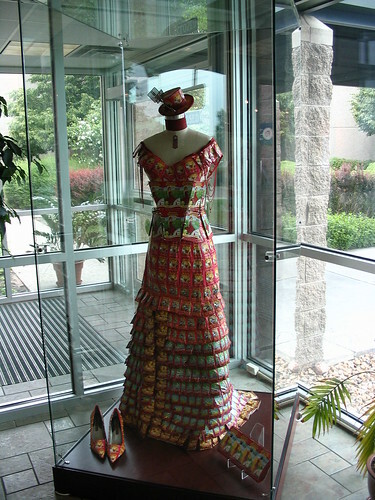 For instance, from the first days of the company, original pieces of art have been commissioned for each blend they introduce… but I don’t know the story behind the decopage tea dress! 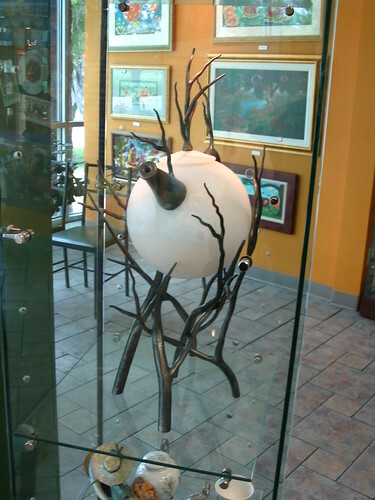 The factory tour starts in the tasting room where you can try samples of several flavors and there are many interesting teapots and original artwork. The tour then moves to the theater where a short video about the history of the company is shown. The video focused in large part about the fair-trade, sustainable practices that the company has always valued. I learned that the company has maintained long-standing agreements with the farmers they source from. For instance, they have purchased Egyptian chamomile from the same family of farmers for more than 30 years. After the donning of hairnets, we moved on to the factory where, unfortunately, photographs are prohibited. On their website, you can take a virtual tour which seems to be fairly comprehensive. Celestial Seasonings is largely an herbal tea/tisane company, so the factory is full of great smelling variety. In addition to ginger from China, there are cloves from Madagascar, lemongrass from Guatemala, hibiscus from China and many others. Since there are so many herbs and otherwise smelly ingredients all over the factory, the tea (Camellia sinensis) is kept separated in a sealed room so it won’t absorb random flavor. The also have to take precautions in the handling of the mint. Mint is quite odoriferous and therefore they can’t even mill it on the premises because it would be impossible to keep the smell from contaminating all the other ingredients prematurely. The sealed room that the milled mint is kept in is only opened briefly so that tour goers can get a whiff. If the door were kept open, the tour guide informed us, eventually you would be able to smell the mint a mile away. The Camellia sinensis is split up into black, green and white tea. I knew that white tea comes from the harvesting of young leaves, but on the tour I learned that it can only be harvested for one week a year in the springtime. I also didn’t know that it is called “white” tea because of fine white hairs that cover the small leaves. The tea that comes to Celestial Seasoning comes from all over the world: Guatemala, Argentina, Tanzania, Burundi, Kenya, India, Sri Lanka, Indonesia, China. I was pleased to learn that the only method of decaffeination that is used at Celestial Seasonings is carbon dioxide. The procedure is performed by another company in Germany before the leaves come to Colorado to be processed, blended and bagged. When I visited, green tea was being packaged. Celestial Seasonings only sells bagged tea, and their machinery can turn out a box of tea in about 7 minutes during peak operation. This corresponds to 10 million tea bags in the whole peak season from October to March. The factory is the largest, most highly automated factory of its kind in the world. 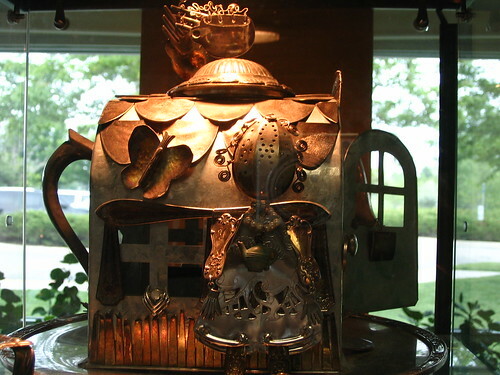 The majority of the machinery used in the factory was invented specifically for Celestial Seasonings. 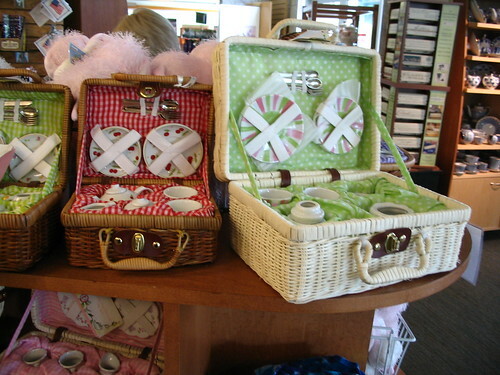 In addition to domestic orders, the company also makes international orders, although those are smaller (10 bags to the box) instead of 20 or even 40 here in the United States. In addition to a smaller box size, French packaging also identifies the product as tisane and not “caffeine free herbal tea” like the US packaging. Owing to an early US law, only Camellia sinensis can be sold with the designation “tea” and companies are able to get around that by calling their products “caffeine free herbal tea”. I restrained myself… for better or for worse! Over all it was a very neat experience to go and see the Celestial Seasonings factory. If you find yourself in Boulder, CO with some free time I suggest you check it out. I hope you can stand the hairnet. For hours and tour times, please see the Celestial Seasonings website.